If Ubisoft has any self awareness. 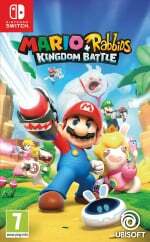 a prospective reveal of Mario + Rabbids Kingdom Battle will be accompanied by self-deprecating remarks around the company's inability to keep secrets. 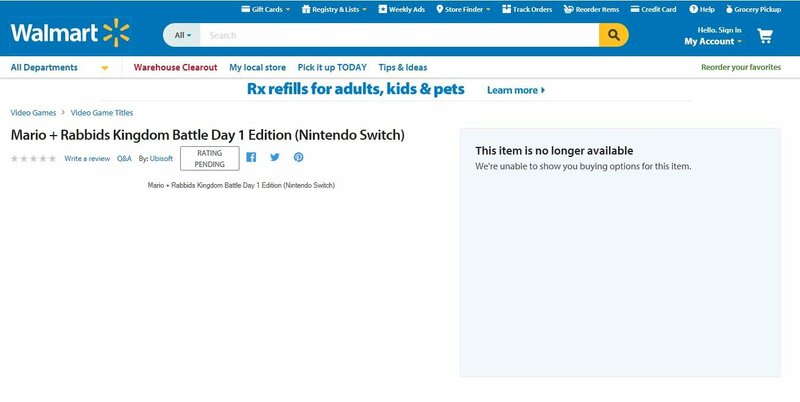 With the Ubisoft Press Conference around the corner a listing has popped up on Walmart for a 'Day 1 Edition'. You can see a screengrab below, with the listing seemingly in the process of being removed; it doesn't appear to be faked either, though such a thing has happened in the past. We're at the point where an announcement today or tomorrow seems inevitable. As a reminder the Ubisoft E3 2017 press conference is today at 1pm Pacific / 4pm Eastern / 9pm UK / 10pm CEST. We'll be hosting the stream and live blogging as it happens. Day 1 Edition.....? Weird. Wonder what they're trying to include to justify that addendum. I prefer Nintendo just leave this out of the spotlight and let UBISoft handle it all. Use the treehouse to show it off. Oh no. Day 1 editions are the stupidest things ever. I actually am really interested in this game. I mean, as long as it looks good, has decent music, and plays well, with a quirky, self-aware, satirical plot, and this has the potential to fill the strategy-RPG gap still open on the Switch. Plus, it's' a big exclusive, particularly since the Rabbids are still popular to a degree. Really looking forward to this reveal. This would make the 5th game Ubisoft will more than likely talk about in their conference (Steep, Rayman, Monopoly, Just Dance, Rabbids) - which would make Ubisoft the most packed third-party conference of all of E3 - further showing that third parties are beginning to shift towards publishing on the Switch. Day One Edition? They gonna force in DLC? 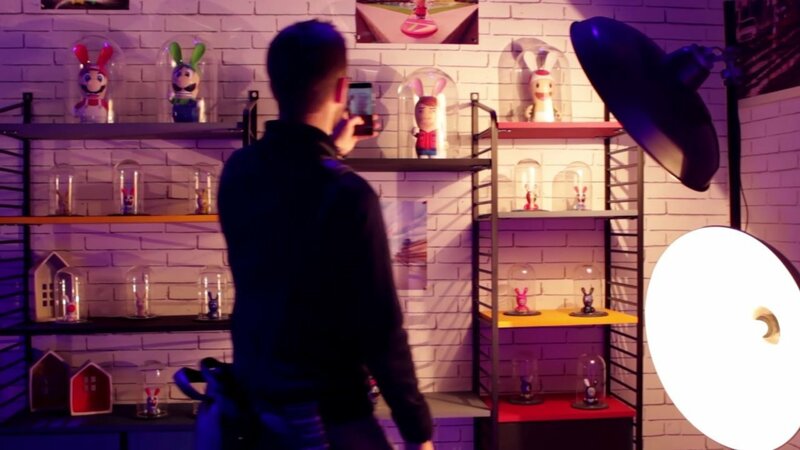 @Fred13 Don't get me wrong, it's a strange choice, and the Minion-esque qualities of the Rabbids aren't the most endearing, but Nintendo wouldn't let it launch if it wasn't a decent product worth our time, yet alone actually do such a crossover if they weren't confident in it. Time will tell, I suppose. But again, I'm looking forward to seeing this be announced. It really is an Ubisoft game. I've adjusted to the idea of buying a game with Rabbids in it. Just make it something worth buying, please. Day one edition??? Daaaaaang. Can't wait for the leak of the leak of the reveal. What if this was all just a big hoax by Ubisoft lol. Ubisoft's leaks: accidental or intentional? I would laugh if this was all just a massively elaborate hoax. @audiobrainiac That's what I am afraid could happen. No matter how real/accurate this looks, I'm still trying very hard to take this with a grain of salt! I know im in the minority but I for one am genuinely excited to hear more about this game. Seems like something that would be fun to play with my kids and maybe get them into RPG's. If it is a decent game I will certaintly give it a shot! I am really curious as to what this game is as "strategy RPG" doesn't really narrow it down too much. I really liked Paper Mario TTYD but don't think I ever finished Paper Mario on Wii. And I liked Color Splash until I got to the matching memory card game the 2nd time. So let's see how it plsys. I feel this is all planned to get interest in a game that no one is interested in! What's with the Nick Cage Rabbid? OMG!! Is true!! I'm crying for the Switch love!! @buildz that seems to imply Nintendo never releases low quality games. Don't get me wrong, I think they have more gems released than any other studio (to be fair there's few that released as many throughout their history) but there are definitely some games that don't warrant a purchase. Whether this will be one of them, how could one know at this point? I don't like Rabbids personally, their humor tends to be equal to that of the average middle schooler, but it could still be a good game, I'm not saying it won't be. It could be bad too, who knows? Kill me now. Quickly, before tomorrow. I want to die thinking of Nintendo as a quality company. @EmmatheBest hahahahahha they revealed today! And it's looks good, somehow. Hopefully this means Pikmin World and DQ XI on Switch (in NA) are real. I doubt it, but I'd be so happy if both of those leaks turn out to be true.